2 år, tyngre modell. Bra bredd i skalle. Mörka ögon, välburna öron. För mycket rynkor i huvud o hals. Utm bröstkorg. Rör sig o visar sig väl. Bra överlinje. Bra päls o färg. Trevlig temperament. Pris pga den rikligahuden pä hals o huvud. Heavyer and larger, very pronounced cheeks. Should have better turn of the underjaw. Too much skin all over the neck. Upright shoulder, excellent ribcage, topline and tailset. Out at the elbows, witch spoils the front movement. Sturdy, active and happy boy. Heavy square head, but cheeky. Good neck. Too much developed broad chest, with pasterns. Well developed body. High set tail. Movement full of fire. Good coat texture. 23 months, Strong young male. Middle long in body. Normal head, middle long neck. Good chest and bones. Front could be better. Enough correct topline and behind angulation. Nail pigment should be stronger. Front movement should be better, good behind. 23 mån, utmärkt storlek och propotion. Kraftfullt huvud, bra ögon. Välburna öron Vacker hals, överlinje och bakställ. välkroppad, välställda tassar. Rör sig väl runtom. Masculine, should not be heavier or wider in front. Strong head, but too much cheeks. Good ears and eyes. Good foreface and nostrils. Correct bite, strong neck. He's dipping behind the withers and could have a better roach. Well angulated behind. Free mover and good coat. Commentary in french / Arvostelu ranskaksi! Trevlig helhet, maskulin mycket bra huvud och uttryck. Bra ögon. Bra öron. Bra hals lite knappt lösbröst. Väl kroppad aning lång i länden. Bra ben o tassar. Rör sig med bra steg. Utm. typ o storlek. Kraftfullt huvud med bra uttryck. Fina öron. Bra överlinje. Kraftig front. Bra bröstdjup. Kompakt kropp. Bra benstomme. God muskulatur. Bra päls o färg. Välvisad. 22 months, strong very good head. Good neck and topline, very wide front. Good body. Good angulation and side movement. Good bite. 2 years old, excellent type, size and substance. Excellent head, body and bone. Excellent mover in front as well as in the backhand. Nice shaped head. Correct ear carriage. Prominent forehead, excellent stop. Square forehead, open nostrils. Lovely dark eyes and sweet expression. Nice wringle. Well developed jaws and underjaw. Well developed basket, nice chest. Well angulated front as well as in the back. Good tailset. Has guality with substance. Good bone and body. Free active mover with good eye. Good mouth. Would like a shade more lenght in leg to balance. Generally pleasing. Bigger bone with strong bone. Typical expression. Well set ears, nice chin. Wide chest. Nicely angulated behind. Correct topline, but heavy in shoulders. Moves very well. 22 mån. gammal välprop med up too size. Väl avsätta öron. Stor bred flat skalle. Välformade mörka ögon. Stor bred näsa med tillräckligt öppna näsborrar. Tillräckligt underkäke. God hals. Topline och svans ?. Kraftig benstomme. Bra musklad. Tillräckligt bröstkorg. Goda rörelser. Mycket Bra könsprägel. Huvud och skalle ngt torrare. Bra bred på käkerna. Ngt mer höjd över pannan. Välburna öron. Vackert rundad, stark hals. Utmärkt benstomme. Aning kortare i länden. Bra muskulatur. Tät päls, ligger väl mot kroppen. Rör sig med härligt steg. Trevligt temperament. 21kk. Syvä, vankka runko. Massiivinen uroksen pää. Syvä profiili ja leveät leuat. Kuuluva hengitys. Leveä etuosa. Voimakkaat polvi- ja kinnerkulmat. Lyhyt häntä. Tyypillinen liikemalli. 21 months very heavy dog. Big massive head. Good placed ears. Deep and wide chest. Straight topline. Very much boned legd. Good coat. Shows wringles in head and neck. Moves well. Large size, but in standard. Very strong young male. Typical expression. Good ears. Powerful neck and body. Typical topline. Good bone. Typical movement. Correct tail. Strong masculine male Compact enough. Nice masculine head, excellent expression. Strong topline with developed body. A bit long in loin. Correctly angulated. Moves well. Needs darker nails. Correct temperament. 20 months. Correct bite. Strong male with nice head. Dark eyes. Slightly rounded skull. Good underjaw. Lips could be a little dryer. Nice topline and developed chest. Straight legs, correct feet. Moves very well. Very strong bones. Correct bite. Nice eyes and typical head. Not enough straight forelegs. Topline could be better. Loose elpows. In the moving narrowing frontlegs. Long loin. Masculine dog. Good skull shape. Very deep chest. Nice roach. Looked good going around. Nose could be slightly shorter. Good size, bones and head. Correct topline. Good movement. Very good type, very nice head and expression. Too much lose skin in neck. Topline ok. Slightly long in loin. Very good chest developement. Slightly big. Very good coming and going, side movement ok. Correct head and expression. Very good bite. Correct ears, good neck. Correct front, enough topline. Correct body, good rear. Moves very well. Commentary in germany! / Arvostelu saksaksi! Commentary in Lithuania! / Arvostelu Liettuaksi! Good size, strong, muscular head, excellent bite. Good front, excellent coat. Nice movement. Excellent type and format. Nice head and correct ears. Strong neck, good topline, good set of tail. Excellent chest, good bones. Correct corners of legs. Nice temperament. Correct and well moving. Nice showing and handling. Strong, heavy, muscular and elegant. Very nice head. Excellent placed small ears. Elegant neck and deep chest. Dynamic moves. Professional handling. Big lad, too much of him for me. Strong masculine head, should be cleaner cheeks and with less wringles. Correct expression. Well shaped and set bat ears, but they are small. Correctly angulated behind, claws should be dark. Well shaped chest, correct tail. Ok angulation and brindling. Moves well behind, falls down on his front. Correct roach. 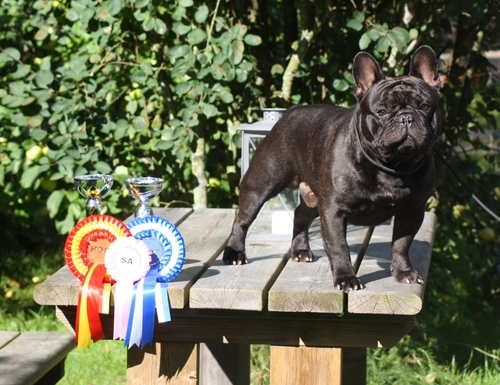 Compact masculine dark brindle. Good balance between skull and foreface. I like a little more length of under jaw. Ear and eye placement very good. Excellent denth, length and spring of rib. Gentle roach with good tailset. Balanced front and rear angulations. Movement sound and very good. A little massive head in the standard, good body. Very good movement, good presentation. Good angulation, is a little open on the elbow. 16 months. Excellent type. Correct eyes, high ears. Good neck, correct topline. Correct front square. Correct size and body. Correct tail. Correct temperament. Correct movement. Very good size and proportions. Excellent bone, very good angulation in front, good angulation in rear. Well shaped body. Masculine head, nice skull. I'd prefer nose more upward. Nice movement. Mycket kraftig unghane med mycket volym i kroppen. Över linjen typisk för åldern. Normal svans. Väl suverän huvud med rätta proportioner. Kraftig bringa. Rör sig mycket bra. Saknar lite självsäkerhet. 13 months old, nice head. Nice skull stop and muzzle. Nice ears, can have more underjaw, nice wrinkeling. Good bone, weak in pasterns, white nails. Not showing himself. Could be stronger in elbows. A little bit long in body, good angulation behind. Good tail, nice coat. Needs more ring training. With his moving now and then good. Good body shape and bone. Good heavy head. Good propotions. Smaller ears. Straight back. Little bit lose elbows. Slight ? claws. A little bit straight angulation behind. Balanced movement. Nice muscular head, with well set ears. Correct bite. Good front, topline and hind quarters. Correct tail. Well angulated behind. A bit out of elbow in movement. Strong movement behind. Commentary in russian / Arvostelu venäjäksi! Excellent general appearance. Correct masculine face. Nice front. Correct topline. Little bit long. Nice strong back. Correct chest. Rear angulations could be more present. Nice in movement. Commentary in german / Arvostelu saksaa! Ryhdikäs juniori, hyvin urosmainen. Vahva luusto ja kaunis ylälinja. Normaali häntä. Hyvin kulmautunut edestä ja takaa. Hyvät tiiviit käpälät. Kulmikas riittävän leveä kallo. Sopiva kuonon pituus, kuonon tyvi saa vielä täyttyä. Hyvä alaleuka ja erinomainen korvien asento. Liikkuu erittäin hyvin. Erinomainen esiintyjä. Nice dog. Good head & expression. Good topline, size, tail and movement. 10 months. Heavy male, strong head with correct expression. Ears typical position for breed. Strong and something short in neck. Correct topline with correct set tail. Correct front and angulations. Correct movement. Very nice temperament. Fin bra skallparti. Kunde ha mer utvecklade underkake. Vackra fladdermus öron. Bra käker och bett. Mellanbruna ögon. Fin vällängd nacke, behöver torrka upp lite i halsen. Bra längd i bröstkorg. Utm päls. Rör sig med bra rullning. High quality puppy. Compact body. Strong bones. Well developed body for his age. Head of right propotions, masculine. Excellent eyes and ears. Right topline. Strong front, well angulated. Moves freely, looks powerfull. Thick coat, well pigmented. Nice temperament. Excellent handling. Nice type, compact enough. Great type of head. Underjaw strong enough. Eyes large enough. Correct topline, a bit soft in movement. Correct tail. Very well developed body for age. Excellent angulations. A bit straight behind. Typical movement. Big boy. Very close to finish picture allready. Plenty of type and shape. Strong head. Superb ears. Lovely wrinkles. Dark sufficient large eye. Needs more chin. Excellent front and rib. Typical top and underline. Excellent hindquarters. Needs more brindle. Excellent mover. A very big and heavy male. Good skull and muzzle, enough jaw. Good earset. Could be a little shorter. Acceptable angulations. Moves typical. Erinomaiset mittasuhteet ja rungon malli. Hyvät pään yksityiskohdat. Tiivis etuosa, hyvä eturinta. Hyvä rintakehän malli. Erittäin hyvä takaosa. Liikkuu ja esiintyy erittäin hyvin. Tyypikäs kompakti urospentu. Hyvä kuono ja hampaat ja sieraimet. Hyvä selkälinja. Hyvät kulmaukset. Tyypilliset liikkeet. Lupaava. Excellent type, compact body, nice head and very beautiful expression. Need more lowerjaw. Exellent ears, typical topline and good tail. Exellent front and ribgade, good angulation, nice temperament. Can be better nail pigmentation. Good coat and color.